In Floudas and Visweswaran (1990, 1993), a deterministic global optimization approach was proposed for solving certain classes of nonconvex optimization problems. An algorithm, GOP, was presented for the solution of the problem through a series ofprimal andrelaxed dual problems that provide valid upper and lower bounds respectively on the global solution. The algorithm was proved to have finite convergence to an ∈-global optimum. 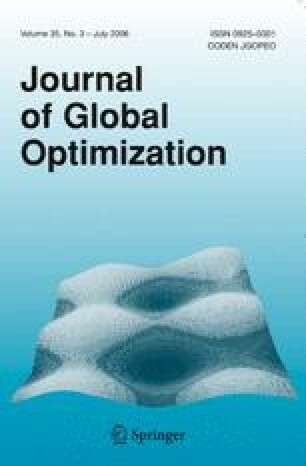 In this paper, new theoretical properties are presented that help to enhance the computational performance of the GOP algorithm applied to problems of special structure. The effect of the new properties is illustrated through application of the GOP algorithm to a difficult indefinite quadratic problem, a multiperiod tankage quality problem that occurs frequently in the modeling of refinery processes, and a set of pooling/blending problems from the literature. In addition, extensive computational experience is reported for randomly generated concave and indefinite quadratic programming problems of different sizes. The results show that the properties help to make the algorithm computationally efficient for fairly large problems.